Bunchberry is a fruit from the coldest temperate regions of the world. It is believed to be a native of Northern China. It grows all over from North America, Greenland, Russia, Northern China and Japan. It usually grows in areas along the margins of moist forests, on old tree stumps, in mossy areas and amongst other open and moist habitats. A slow growing perennial herbaceous subshrub upto 10–20 cm tall, forming a carpet-like mat; above ground shoots rising from slender creeping rhizomes that are placed 2.5–7.5 cm deep in the soil, and form clonal colonies under trees; above ground stems vertically produced, slender and unbranched. 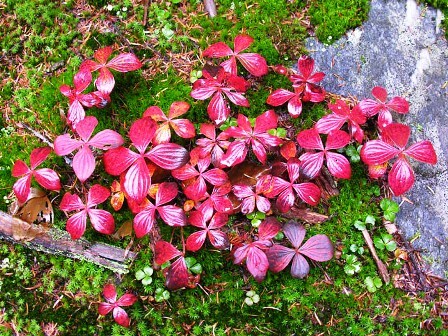 Leaves shiny dark green, turning red in fall; opposite, 3.5 to 4.8 cm long and 1.5 to 2.5 cm wide, with 2 or 3 veins and cuneate shaped bases and abruptly acuminate apex; clustered with six leaves that often seem to be in a whorl because the internodes are compressed; leafy green leaves are produced near the terminal node and consist of two types: 2 larger and 4 smaller leaves; smaller leaves develop from the axillary buds of the larger leaves;; petioles 2-3 mm long, leaf blades obovate, margin entire. 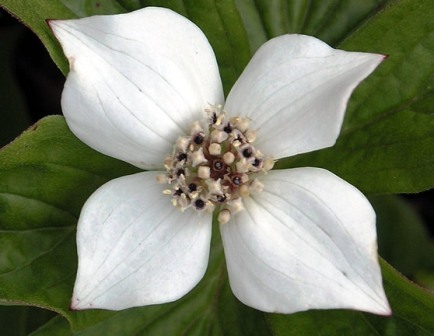 Inflorescence are made up of compound terminal cymes, with large showy broadly ovate, 0.8 to 1.2 cm long, 0.5 to 1.1 cm wide, white bracts with 7 parallel running veins, flowers white, calyx tube obovate, 1 mm long, densely pubescent; petals reflexed, ovate-lanceolate and 1.5 to 2 mm long; stamens very short, 1 mm long; anthers yellowish white , narrowly ovoid: styles 1 mm long and glabrous. Fruits a drupe, green, globose round; bright red at maturity, 5 mm wide. 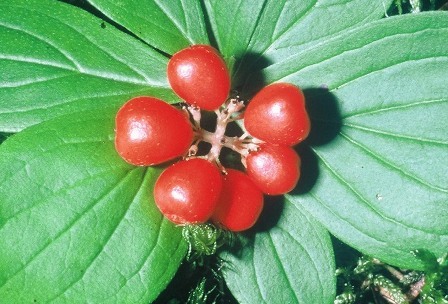 Bunchberry fruit are edible. Though these are rather dry and a bit gummy too, yet are pleasant to eat. The taste is sweet and the flavour resembles somewhat with that of apples. The fruits being eaten raw, can also be added to breakfast cereals or used for making jams, pies, puddings et. These make an excellent ingredient for steamed plum pudding. 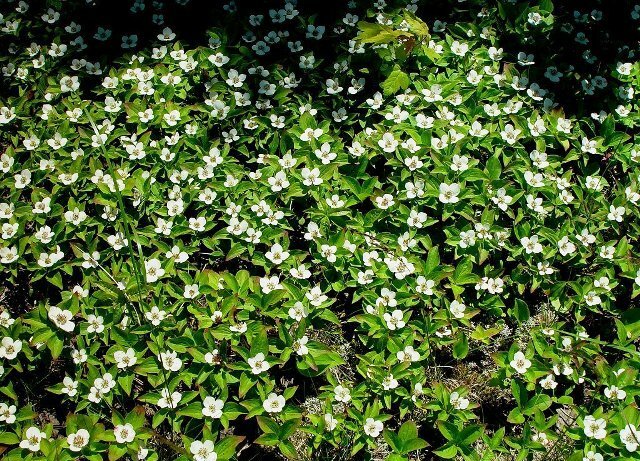 Bunchberry is a very good choice for a ground cover. The plant can grow in nearly all kind of soils. It will, however perform best in moist locations. New plants are raised from seed. The seeds, however, take long to germinate, sometimes upto 18 months. Young plants would require weeding during the first 2-3. They settle well after that.